Whether the infectious disease branch of modern medicine is truly unaware or just does not want to admit they are completely wrong on how to cure a viral syndrome remains a debatable point. Certainly, their "find a vaccine for everything" approach to viruses is not the answer. Even if a vaccine could be introduced into the body without associated toxins and severe side effects that was effective in decreasing the chances of contracting a given viral infection, such an approach does absolutely nothing for the individual who is already critically ill with an overwhelming viral count in the body. And it does nothing for the individuals who remained virus-free yet suffered debilitating side effects. Can we say the obvious about vaccines? Of course, no serious attempt has yet been made to detoxify vaccines, and no serious efforts have been made to allay the very real panoply of substantial side effects that so many vaccines can inflict. Even truly effective vaccines, of which there are not many, still do a substantial amount of harm to many individuals who would never have contracted the given infection in the first place. The interests of the public health are never served by inflicting upon it an array of medical conditions that would never have otherwise existed in the name of preventing a given infection. To add to the concerns that so many individuals have today toward infections that they are lead to believe have no reliable treatments, Hollywood has contributed its own version of hysteria in both TV and movies with the many stories of killer epidemics that are somehow managed just in the nick of time to assure the happy ending. In these movies, invariably, the epidemics are finally addressed with some "magical" vaccine or antidote. A partial list of such movies includes Contagion, Outbreak, Quarantine, Virus, and even one called Ebola Syndrome. To date, not a single virus has been tested that is not inactivated (killed) by a large enough dose of vitamin C (ascorbic acid). Many other antioxidants have similar virucidal effects, but vitamin C appears uniquely to be of greatest potency and clinical efficacy, as its simple chemical structure allows for it to be disseminated throughout the body with little restriction. As such, it is able to effectively address viral populations present in both the intracellular and extracellular spaces. Other antioxidants have been found to have higher ORAC (Oxygen Radical Absorbance Capacity) values – measurements which are used to quantify the antioxidant capacity of supplements (or foods). However, a virus can never be incapacitated by a potent antioxidant if the chemical structure of that antioxidant does not permit direct contact between the virus and the antioxidant. Vitamin C is both very potent and optimally bioavailable in accessing any viral infection. Why is vitamin C so effective in killing viruses? A primary way in which vitamin C destroys viruses, or sets them up for destruction by the immune system, is by activating the "Fenton reaction". In a nutshell, this reaction can proceed inside the virus, inside cells in which viruses are replicating, and on the surfaces of the viruses themselves. The result of this reaction that is stimulated by the presence of vitamin C, one or more transition metal cations, and the local presence of peroxide is the immediate production of hydroxyl radicals. These radicals are the most reactive oxidizing agents ever identified. As such, they radically upregulate oxidative stress and end up destroying whatever is in their immediate environment. The effects of vitamin C in "mopping up" after it inflicts its viral damage are further supported by its potent and multifaceted support of the immune system. There is no other substance that singularly does as much to promote increased and strong immune function as vitamin C.
Among many other effects, vitamin C directly stimulates interferon and antibody production, while effectively supercharging the functions of the white blood cells by becoming very concentrated inside those cells. 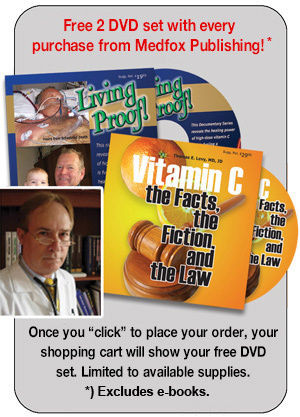 To be balanced, it is also important to note that the effects of vitamin C on chronic viral infections, such as chronic hepatitis, AIDS, or HIV-positive states are less profound, as the virus works its way into physical locations much less accessible by vitamin C than when the viral infections are acute. Nevertheless, long-term, highly-dosed protocols of vitamin C often completely control and even occasionally cure these diseases. The actual evidence showing what vitamin C has done and can continue to do if properly utilized is there for anyone to see and review. The ‘multi-C protocol’ will reverse and cure any viral syndrome if secondary organ damage has not already advanced too far. Even then, many cases that would seem hopeless can still show dramatic clinical responses. This is a disease that spreads most effectively among populations that have a substantially poorer nutritional status than is seen in the United States and other well-fed populations around the world. Of course, any exposure to a high enough titer of virus can allow an infection to "take hold," even in a well-nourished individual. Don't worry. If Hollywood and the Centers for Disease Control (CDC) want to induce the populations of the world into a full-blown panic, so be it. You have the tools to prevent a virus like Ebola from ever setting up shop in your body. And if your prevention should fall short, resolution and cure is a simple process, and it should occur for all but the most immune-challenged, chronically ill, and malnourished individuals among us.